Aleph Objects, Inc.® continues to demonstrate the power of Libre/Open Source Hardware development with the new LulzBot™ TAZ 4 3D printer, the sixth generation of LulzBot's TAZ model 3D printer in the last year. The latest improvements make the machine more robust and capable than ever. Notably, TAZ 4 comes wired for a quick upgrade to LulzBot's forthcoming dual extruder add-on for 3D printing with multiple filament materials. Beyond being a better 3D printer, TAZ 4 demonstrates Aleph Objects' continued commitment to user freedom. TAZ 4 includes a streamlined modular printer head carriage for a wide range of accessories. With add-ons, LulzBot 3D printers can take advantage of over 12 different kinds of 3D printer filaments, including rubber-like NinjaFlex. 3D printers are in stock now and shipping globally. Learn more about TAZ 4 by watching the product announcement video. High resolution pictures of the printer are available online. Aleph Objects, Inc. is the Libre/Open Source Hardware company that manufactures the LulzBot 3D printers, parts and filament. 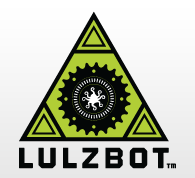 All LulzBot products can be copied and/or modified without restriction, giving everyone the tools to freely conceive, create, and manufacture products and prototypes.